You are at:Home»iPhone»Phone»iPhone Not Making Calls? Here’s Why & The Fix! Your iPhone won’t make calls and you don’t know why. No matter which number or contact you try to call, nothing happens. In this article, I’ll explain what to do when your iPhone is not making calls! Why Won’t My iPhone Make Calls? 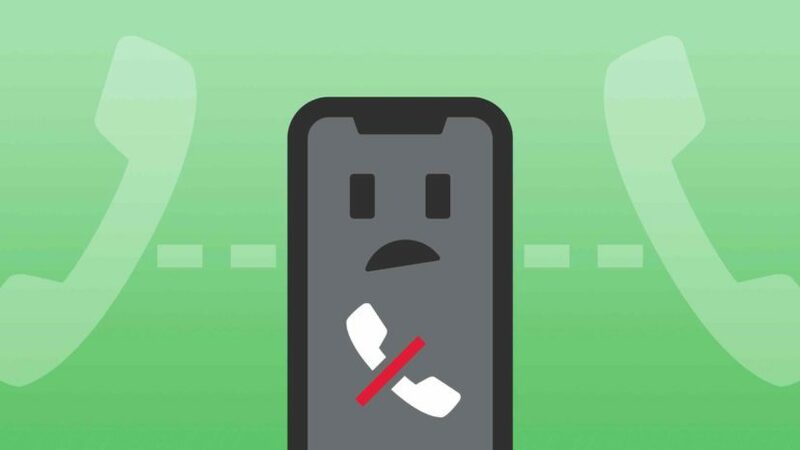 Before diving into our troubleshooting guide, I’d like to clear up some misconceptions about why some iPhones don’t make phone calls. Many people immediately think their iPhone is broken when it won’t make phone calls. However, it’s actually your iPhone’s software, not its hardware, initiates a phone call. Even a minor software crash could prevent you from calling your family and friends! The first steps in our troubleshooting guide will help you diagnose and fix potential software problems your iPhone is experiencing. Does Your iPhone Say “No Service”? We also can’t rule out the possibility of an issue with your cell service. Take a look at the upper left-hand of your iPhone’s display. Does it say “No Service”? If your iPhone says “No Service”, that’s probably the reason why it can’t make phone calls. Check out our other article to learn how to fix the “No Service” problem on your iPhone. If your iPhone does have service and won’t make phone calls, follow the list of troubleshooting steps below! First, let’s rule out a really minor software problem by restarting your iPhone. Turning off your iPhone allows its programs to shut down naturally and get a fresh start when you turn your iPhone back on. iPhone 8 and earlier models: Press and hold down the power button until you see slide to power off appear on the display. Swipe the power icon from left to right to shut down your iPhone. Wait a few seconds, then press and hold the power button again to turn your iPhone back on. iPhone X and later models: Simultaneously press and hold either volume button and the side button until slide to power off appears on the display. Then, swipe the power icon left to right to turn off your iPhone. To turn your iPhone back on, press and hold the side button until the Apple logo appears. 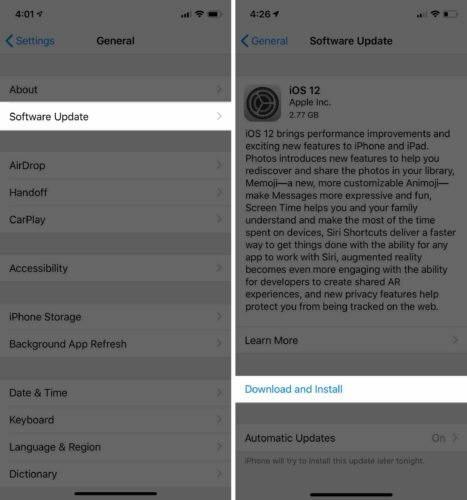 Apple and your wireless carrier occasionally release carrier settings updates. These updates generally improve your iPhone’s ability to connect and stay connected to your carrier’s cellular network. 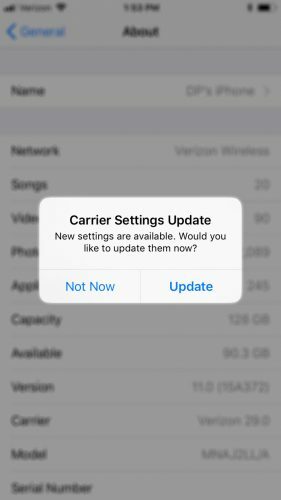 Most of the time, you’ll know a carrier settings update is available because a pop-up will appear on your iPhone saying Carrier Settings Update. You can also manually check for a carrier settings update by going to Settings -> General -> About. A pop-up will usually appear within ten seconds if a new carrier settings update is available. After checking for a carrier settings update, go to Settings -> General -> Software Update to see if a new iOS update is available. Apple regularly releases these updates to improve your iPhone’s performance, fix bugs, and roll out new features. Tap Download and Install if a new software update is available. Make sure to check out our other article if you have any issues updating your iPhone! The SIM card is the small piece of technology that connects your iPhone to your wireless carrier’s network. If the SIM card has become dislodged or damaged, your iPhone might not be able to connect to your carrier’s network, which would prevent you from making phone calls on your iPhone. Check out our other article to learn how to fix SIM card issues! Resetting your iPhone’s network settings will restore all of its Cellular, Wi-Fi, Bluetooth, and VPN settings to factory defaults. By restoring these settings to factory defaults, we may be able to fix a software problem by completely erasing it from your iPhone. You’ll lose your saved Wi-Fi passwords, Bluetooth devices, and VPN configurations when you reset your iPhone’s network settings. You’ll have to set these settings up again after the reset is complete. 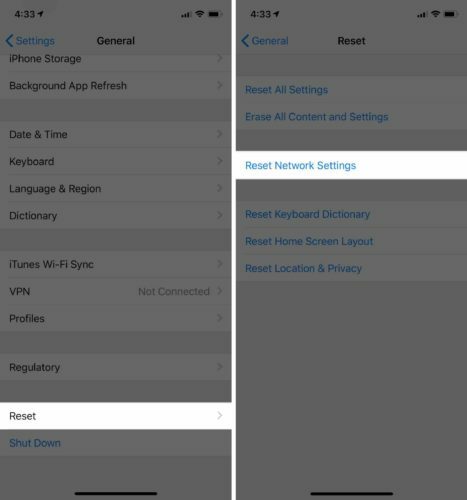 To reset network settings on your iPhone, go to Settings -> General -> Reset and tap Reset Network Settings. Then, tap Reset Network Settings when the confirmation alert appears on the display. Your iPhone will reset and turn back on once it’s finished. The final step we can take to completely rule out a software problem is the DFU restore. A DFU restore erases all the code on your iPhone and restores it factory defaults. We strongly recommend saving a backup of your iPhone before putting it in DFU mode! Check out our other article when you’re ready to put your iPhone in DFU mode and restore. It’s time to get in touch with your wireless carrier if your iPhone still won’t make phone calls. Even if your signal looks good, there could be an issue with your cell phone plan. We recommend contacting your wireless carrier before Apple. If you go to an Apple Store and tell them your iPhone is not making calls, they’ll probably tell you to go talk your wireless carrier first! If your carrier isn’t listed above, a quick Google search for their customer support number should get you headed in the right direction. If you’ve contacted your wireless carrier and they can’t help you, your next trip should be to the Apple Store. Schedule an appointment and have an Apple tech or Genius take a look at your iPhone. In rare cases, an iPhone may stop making calls because of damage to one of its antennas. Your iPhone is making phone calls again and you can get back in touch with the important people in your life. Next time your iPhone is not making calls, you’ll know how to fix the problem! Leave any other questions or comments you have about your iPhone down below. Previous ArticleDo Not Disturb While Driving: iPhone Safety Feature Explained! Next Article Does Apple Track You On Your iPhone? Here’s The Truth!